The world has entered a period of difficult times. Millions of people have lost their jobs, companies that have had many years of success are closing their doors and people around the world are looking for ways to reduce their expenses. This article suggests some ideas that could reduce the costs of providing essential English second language materials to your children. Most ESL materials are prepared to meet the needs of a diversity of cultures. It is a financial necessity for companies that are publishing printed books and selling them worldwide to include a wide variety of content. Due to the differences in cultures not all content can be appropriate for all countries. Many children in some Asian countries begin English classes at the age of three. The emphasis is on learning facts and producing perfect work. Alternatively, in the South American countries the children start learning English between the ages of seven and ten if it is offered at all. The emphasis is on building positive social relationships through language, music and art. How can you adapt a curriculum to make it reflect your culture? When you download ESL materials online, you can restrict your printing to the pages that you need – This gives you an opportunity to review each page and decide whether its content is appropriate for your children. There will be some limitations – you will need to see that the storyline in maintained and the necessary phonics and grammar are intact. Considering these basics as you work, you will likely find some pages that aren’t necessary or relevant for your students. Remove these from your printed copy. You now have a children’s ESL textbook that is shorter, consequently cheaper to photocopy and more appropriate for your children. Your book will have some page numbers missing. You can ignore this, you can print the numbers by hand or you can type them on a label(s), cut them and place them over the originals. What about the time required to make these changes? Your administrative staff and / or teachers will need to take time to decide which pages are to be omitted. Volunteers, parents or older students can save your time and your money. They can adjust the page numbers as needed, photocopy the books – printing on both sides of the paper – and bind the books. Staples will be the easiest, cheapest and the most efficient. How can colorful activities be used many times? Although laminating is quick, efficient and durable it is also very expensive. We were surprised to find that the equivalent dollar price was the same in Canada and Mexico! 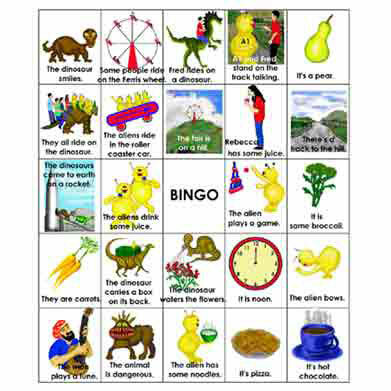 We suggest that you try using transparent sheet protectors for full page activities such as Picture Bingo. These are clear plastic envelopes that are open at the top and usually have loose-leaf binder holes at the side. Print the colorful page on one side of the paper only, insert it into the clear envelope and seal the top with scotch tape. To further cut costs, it is possible to insert two consecutive full page games back to back. If you have a set of Bingo 1 and another set of Bingo 2 then place Card 1 of Bingo 1 back to back with Card 1 of Bingo 2. This allows you to use one envelope for two cards without any conflict as you wouldn’t be playing two different games at one time. What about games that require a number of small cards? Rather than going to the expense of laminating these, try to find an outlet that sells clear contact paper – it is available by the roll, by the meter or in large sheets. The small cards can be placed face down on the contact paper and cut. All of these suggestions will be facilitated by using volunteers or older students. Asking parents to help not only saves you time and money, it has the added benefit of enhancing your community relationships. We hope that you will be able to adapt these suggestions in a way that will assist your school and the families of your community through these difficult economic times. Successful ESL hopes you will consider these ideas and then – Do It Your Way. Hi there,I read your new stuff named “Tips for Saving Money on your Children’s Curriculum” on a regular basis.